Starting April 16th, eight casting facilities participated in the donation drive, collecting food and goods from casting directors, actors, agents, SAG-AFTRA reps, and any passers-by who wanted to help the North Hollywood Interfaith Food Pantry. The event culminated with a social mixer of nearly 200 agents and CDs at Q Billiards, where items were raffled off to raise even more money for the charity. Our combined efforts raised more than 220 bags/boxes of food and goods and almost $1,200 in donations. Congratulations to all those raffle item winners, especially the raffle grand prize winner The Envy Agency, which won the Submission Services Package, consisting of one month of free agent service on Breakdown Services and five Premium Profiles on both LA Casting and Casting Frontier. The combined package was worth an amazing $1,700! Special thanks are in order to Breakdown Services, Casting Frontier, and Casting Networks for their generous gifts to benefit a great cause. Finally, thank you to all the volunteers at the event, especially John McCarthy, Megan and Chuck Marra, and Sherrie Henderson for working the front desk. Without the help of these amazing volunteers the event would never have run so smoothly… and of course a big thank you to the committee members who made this whole thing happen: Arlene Schuster, KellyAnne O’Callaghan, Jacob Klempner, and Vicki Goggin. 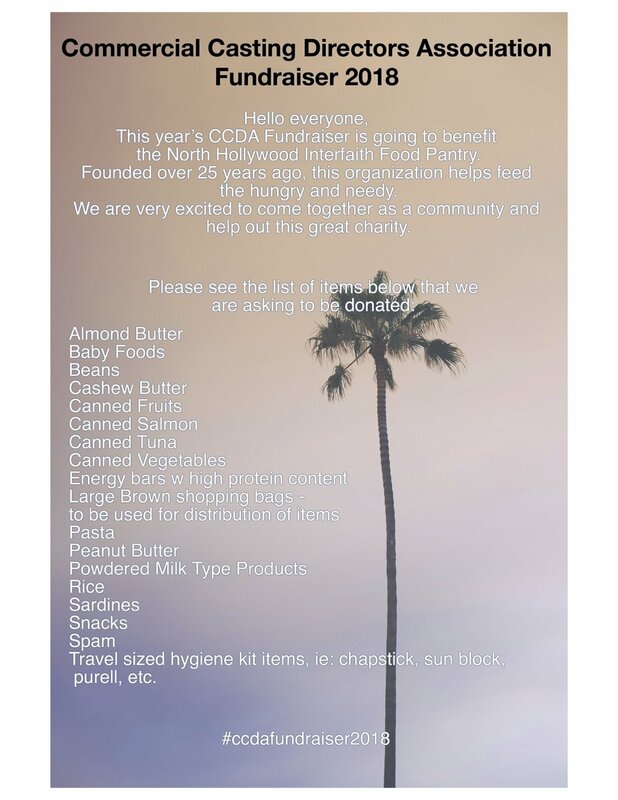 CCDA (Commercial Casting Directors Association) is collecting items for the Interfaith Food Pantry. Actors/Agents/Casting Directors working together to help feed those in need. Go to https://www.ccdala.com/fundraiser to see what items you can bring to your next audition! (Canned Foods, Peanut Butter, Energy Bars, Travel Size Toiletries, etc…) Collection Centers: 200 South La Brea, Larchmont Studios, Exclusive Studios, Village Studio, Ocean Park Studios, 5th Street Studios, On Your Mark Studios, Southpaw Studios.